The human body is a fascinating piece of organic architecture, and in many respects, it resembles the building of a house. Much like a home requires bricks and mortar to take shape, the human body requires building blocks in the form of protein to keep itself together. 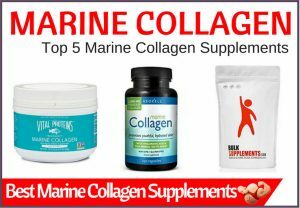 Do I Need To Supplement My Collagen Level? Fortunately, help is at hand in the form of supplements and superfoods. Few proteins are as essential to our health as collagen. If protein makes up the bricks of the human body, naturally occurring collagen - which comprises around a third of the proteins in our bodies - is the cement. Collagen is a fibrous protein responsible for healthy skin, bones and cartilage, divided into four main types within the body. As we reach maturity, our bodies produce less of this essential component naturally. This is why we begin to experience wrinkles, joint pain and limited mobility as we advance in years. The name collagen is taken from the Greek word for glue, kólla, but don't be misled by this; collagen is more akin to the oil in an engine, helping to keep our joints smooth and mobile. A shortage of collagen has been linked to the onset of rheumatoid arthritis as joints begin to lose their flexibility and swell, while this elasticity also applies to the skin. A lack of collagen in the body can result in wrinkled facial muscles, stretch marks, and cellulite, hence why it remains a key ingredient in any number of bestselling skincare products and a favorite tool of cosmetic surgeons. The essential protein is also linked to hair, as a body that fails to produce sufficient levels of collagen will result in brittle follicles that lose their color. 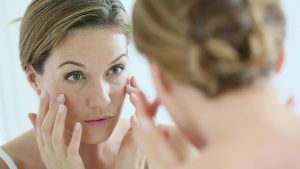 There are a handful of lifestyle changes that can slow down the demise of collagen in your body, such as avoiding excessive sunlight, smoking or sugar. However, human biology dictates that eventually our bodies will struggle to create this protein organically at the pace to which we are accustomed, regardless of how healthy a lifestyle we lead. When this inevitable time arrives, it is in anybody's best interests to start investigating safe, alternative methods of ingesting this essential substance. 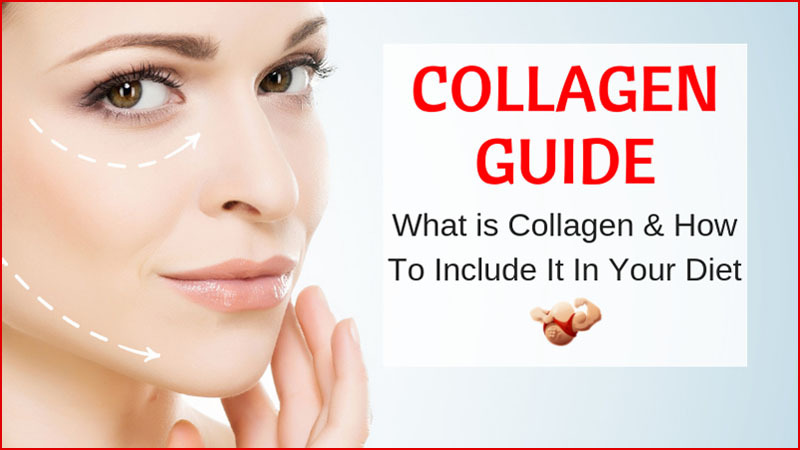 There are approximately 16 types of ‘known’ collagen in the body, but there are four main ones. Type 1 renders the most effective use, and comprises between 80-90% of the total collagen within the human body. All collagens serve the same purpose – to protect certain areas of cells, prevent undue stretching and act as a ‘buffer’ between cell layers to prevent damage. This is the most abundant type of collagen in the body, and believed to be the strongest and most effective. 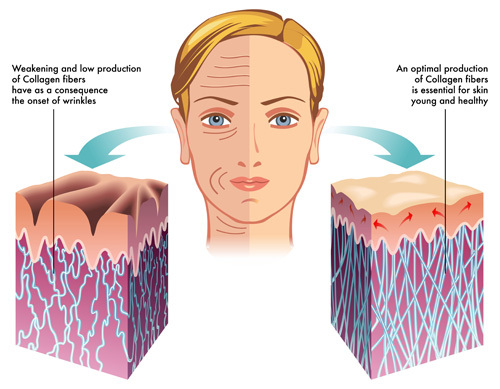 Fibers are found in areas of the body such as tendons, ligaments, internal organs and of course, the dermis (skin). This type of collagen is the foundation of healthy bones, but it is also found in the gastro-intestinal tract. It is also imperative in keeping the skin elastic and for healing wounds. This type of collagen is responsible for building cartilage, which is found in our bodies in connective tissues. Mobility, joint pain and even certain types of arthritis can be assisted or relieved particularly during maturity. Coupled with Type 1, this collagen is responsible for firm and elastic skin, but is also present in the blood vessels and vital tissues in the heart. Omnipresent in the stomach, Type 4 collagen is the foundation of basal lamina, which promote the healthy growth of cells that form surrounding tissue of organs and muscles, and are also necessary for certain blood and nerve function. They act like a cushion or padding for the tissues to prevent damage. There are other types of collagen in smaller quantities, one of which is particularly essential to pregnant women, as it is present in the placenta. The placenta provides essential nutrients to a baby during its gestational period and develops in the uterus during pregnancy. The collagen contained in the placenta acts as a protective tissue in order for nutrients to pass through and unwanted toxins to be dispersed without problems. We have established that collagen is a complex protein, comprising of nineteen varying amino acids. The human body reacts to these in different ways, finding some of them essential to perform the various, multifaceted functions of a living person, and others conditional, ensuring that any removal or degradation would not result in serious long-term health issues. The four primary amino acids that make up collagens are arginine, glutamine, glycine and proline. The first of these, arginine, is linked very closely to cardiovascular health and blood flow. The human body typically contains enough arginine to remain healthy, meaning that it will not require additional supplements – especially given that it is not considered an essential amino acid by all sources. However, the benefits of arginine are numerous, including but not limited to treatment of erectile dysfunction in males and insulin sensitivity in those living with diabeties. It has also been claimed that arginine reduces high blood pressure, making it hugely beneficial for anybody with hypertension. Glutamine, sometimes referred to as the building blocks of protein, is the most abundant amino acid found in the human body. Again, whilst it is only conditionally essential, glutamine plays a number of roles in keeping us healthy. Primarily located in the blood, glutamine acts to balance out the natural acids found throughout the body, preventing degradation and damage to cell tissue. Glutamine also burns fat, which is why you’ll find it available as a supplement in any health food shop. Perhaps most importantly, this amino acid works to heal wounds within the body; making it invaluable to patients in recovery from major surgical or medical procedures. As if that wasn’t enough, glutamine is a crucial element of the collagens that keeps our skin lithe and bones strong. Glycine is once again dubbed a conditional amino acid, but remains hugely essential to a healthy adult or child – indeed, shortages of glycine have been linked to growth restrictions. Used to relay messages from body to brain, glycine is primarily linked to the central nervous system; as a result, it has been linked to treatments for schizophrenia and stroke prevention. Anybody with a passing interest in bodybuilding will also be aware of creatine, which incorporates glycine into its biosynthesis. This is because another key benefit of glycine is muscle recovery. Glycine may be the smallest and simplest amino acid found in our bodies, but it remains one of the most important. Proline, technically an i﻿mino acid though still referred to as an amino acid, makes up around 15% of a collagen, and primarily serves to decrease the risk of heart disease and keep our skin healthy. Proline acts to decrease the pressure of fatty build-ups around the arteries by releasing the offending fat deposits back into the bloodstream, in addition to breaking up larger protein sources and redistributing them as necessary. Proline also assists in the replacing of damaged muscle and skin tissue, making it a hugely popular ingredient in a number of over-the-counter skincare products thanks to its ability to plump up the appearance of skin. There are a multitude of foodstuffs that can assist in keeping collagen levels up, or promoting production. Foods very high in protein content such as beef, chicken, turkey, fish and eggs all promote the levels of collagen in our bodies. Promoting collagen from within the body by digestion, will help not only internal organs, cells and tissue, but also radiate outwards to keep skin glowing and supple. The aging process cannot be halted, but it can certainly be on time delay by taking care of your diet. 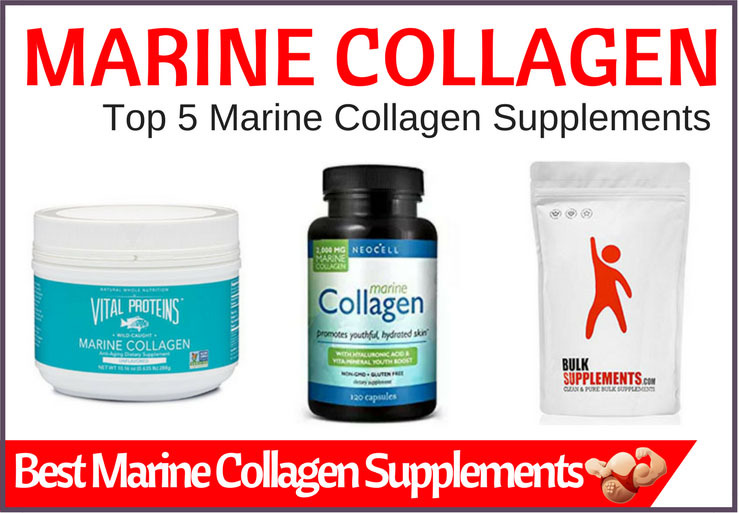 Types 1 and 3 collagen can be found in the skin, bones and muscles of cows and contain the most prolific amino acids – proline and glycine, essential for building healthy muscles and encouraging the body to produce collagen naturally. These amino acids are responsible for most parts of the body such as hair, skin, bones, ligaments and tendons, as well as muscles. They are also a prevalent factor in healthy teeth, gums and eyes. Beef or bovine collagen is also responsible for improving gut health and promoting restful sleep patterns. Chicken and turkey collagen are rich in Type 2, responsible for building cartilage and promoting healthy joints (particularly good for osteoarthritis). Certain sulfates (namely chondroitin and glucosamine) are believed to have anti-aging effects thus promoting healthy skin. Consumption of chicken collagen is known to be useful particularly in reducing back and neck pain and is often recommended for use after surgical operations, for recovery processes. It can be no coincidence that inhabitants of Far Eastern countries, who consume chicken feet, maintain their collagen levels. Eggs contain an array of collagens which are mainly found in the whites of the egg, although research is being conducted as to the value of egg yolks. The primary collagen is Type 1. The various types of amino acids contribute to building and repairing muscles and tissues, but are also beneficial in the healing of wounds. Eggs are high in protein, but also contain B vitamins, Vitamin E and other essential amino acids and are a nutritious addition to any diet. The best way to eat eggs to provide collagen is hard-boiled, as less of the collagen rich membrane is lost in cooking. Type 1 collagen is prevalent in fish and is easily the most absorbable and contains the amino acids of proline and glycine. Fish collagen is most known for digestion and a support mechanism for bones, skin, blood and most of the vital organs, including the heart. Working in conjunction with Vitamin C intake, necessary to keep collagen levels at opti﻿mum﻿﻿﻿ capability. 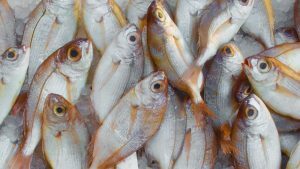 As collagen is found in the skin, scales and bones of fish, it is better to consume fish that has been cooked skin on and bone intact (don’t eat the bone!). A whole fish that has been foil-wrapped and cooked in the oven will not only retain as much collagen as possible, but also have a better flavor. Collagen can be found in many other foodstuffs, not just animal products, which is good news for vegetarians and vegans. Cabbage is probably the best vegetable for producing collagen as it contains a wealth of phytonutrients that boost skin quality, as the same time as being a hydratio﻿﻿n agen﻿﻿t. 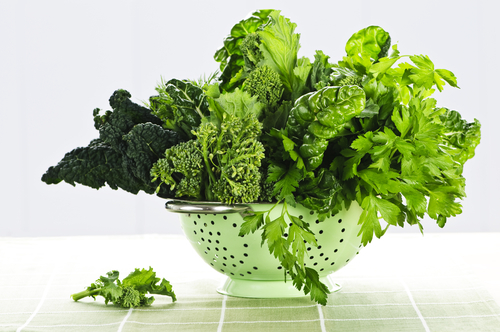 All types of leafy greens are an excellent addition to a diet in any case as they also provide fiber, folate, iron, potassium phosphorus and manganese. Vitamin B6 is also present, making it an all-round great choice for overall health as well as promoting collagen production. Berries in particular are full of antioxidants which not only promote collagen production, but also supply protection for the skin and cell function. Apples, cherries, strawberries, raspberries are all excellent dietary choices. Citrus fruit, such as oranges and lemons have a particular role to play in collagen production as they contain Vitamin C, which acts in tandem with certain amino acids such as proline and glycine. Rich in antioxidants, they combat free radical damage to the skin in particular, and help with the aging process. Antioxidants also fight infection and everyday diseases. On the vegetable side, the color red is still important. Varieties such as beets and red peppers are also anti-aging vegetables that promote collagen production. Carrots should also be included, as they include Vitamin A, which again increases collagen production more by protection of the skin and increasing blood flow. 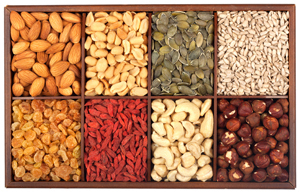 Nuts and seeds are a healthy part of a daily diet, but certain varieties are good providers of a collagen source, as they contain Vitamins A, B, C and E, as well as zinc and copper which work with amino acids to support production. They are also an excellent source of Omega 3 fats. Omega 3 fats are essential for collagen production to encourage soft and flexible skin. We cannot produce these fats naturally, so including them in your diet is essential. Best nut sources include almonds, walnuts, chestnuts (untreated for all varieties – raw is best). Most seeds are good for you, but the emphasis should be on sunflower, chia, pumpkin, flax, hemp and tahini (best made as a paste) as they contain the most viable nutrients to support collagen production. Whilst technically not a nut, include coconut in your diet as coconut products such as flour, coconut butter and coconut oil contain a good source of protein, B Vitamins and healthy fats, which aid collagen production. Soya products contain a hormone, genistelin, which will enhance the production of collagen. They also contain a high level of antioxidants that will provide protection against skin and cell damage. Soya can be ingested in different foodstuffs, including milk, cheese and soya mince. Beans contain hyaluronic acid, which will boost and encourage healthy cell growth and increase collagen synthesis. This acid retains water, which encourages hydration for the skin and overall health (please note – hydration is essential to maintain a healthy body). It only takes a few tablespoons of beans to promote new cell production and keep joints flexible and healthy. The most natural but harmful cause of reducing collagen production are free radicals in the air, which not only stem the flow of collagen, but can and will cause deterioration of your skin. Any form of radiation, whether due to exposure or medical treatment. The only way to combat smoking damage is to give up! Dehydration is easily solved by drinking adequate amounts of water during the day/night. Strong factor lotions when you are out in the sun are also necessary. If you have had surgery that results in radiotherapy, your medical practitioner will suggest the best course of treatment to restore your skin as best as possible. In terms of combatting free radicals, antioxidants contained in foodstuffs will win the battle. The answer is a tricky one. It depends whether you are on a well-balanced diet, whether you work in a profession whereby your skin and body are likely to be affected (hot environments, exposure to constant heat and sunlight), or alternatively, in a profession where your skin really matters (models, actors etc). However, your body is equally as important as your skin and your looks – inadequate collagen can cause untold internal cell damage as well as external. Before launching into the complex world of purchased supplements, take a look at your diet and see how you can improve and supplement your collagen levels by diet. One of the most ‘revolutionary’ and recommended additions to your diet is the creation of bone broths, which will supply you with a sensible amount of collagen, merely by boiling up bones from chicken or beef. Yes, it is as simple as that. There is a reason that your grandma would serve you chicken soup or broth when you were a child and fell ill.
Chicken broth contains all the nutrients that you could possibly require, as it is generally made by using the bones, ligaments, cartilage and other parts of a chicken that eventually, after boiling, turn into a gelatinous mass – cue gelatine, that is exactly what it is. So that is one method of ‘supplementing’ your diet to provide adequate amounts of collagen to fulfil the needs of all of your cells, not just skin – it’s inexpensive too. Ensure that the supplements you purchase come from a reputable manufacturer, i.e one that is regulated by the FDA or other local country governing body. Imports can be of negative usage and contain ingredients that will possibly damage your health. When purchasing – CHECK THE LABEL for all contents, and if in doubt, query this with the seller. The majority of supplements are made from chicken, so if you are a vegetarian, this will not be acceptable. Consider ‘bio-availability’. If the product states this, then it will be much more easily absorbed into the bloodstream, and thereby more effective. 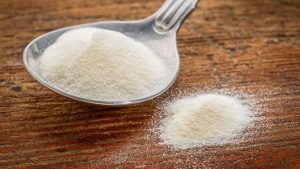 Generally speaking, liquid versions of collagen supplements will be far more likely to provide easy absorption than tablets or powder, that’s just the way it is. 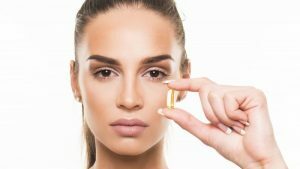 Supplements that contain Type 1 and Type 3 collagen will be the most effective in the body – these are what you need most of and most likely to be deficient of. If you are purchasing particularly to elevate skin condition, look for products that have been ‘hydrolyzed’. This means that it has been broken down naturally, much like the cooking process and will therefore be easily absorbed. Otherwise it will consist of large molecules which will be difficult to absorb. If you have undergone surgery, your medical practitioner may recommend collagen supplements at a relatively high dose. This will trigger faster wound repair. Check that your supplement contains Vitamin C, hyaluronic acid, co-enzyme Q10 and chondroitin sulfate – these will act both internally and externally. Just be careful on your choice of supplements, and where possible, consult with a medical practitioner or a nutritionist or dietician.